Most years we enjoy sharing some of the beautiful children’s titles that are shown in our holiday display here at the shop. Some are new this year; some are older classics. 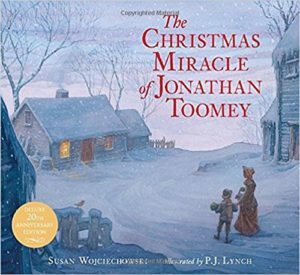 We have others, too, of course – from the tender and gorgeous The Christmas Miracle of Jonathan Toomey (by former Yorker Susan Wojciechowski and those marvelous illustrations by Irishman P.J. Lynch) to a family favorite Why Christmas Trees Aren’t Perfect to the wildly dazzling art of Julie Vivas’s The Nativity (where the robed angel wears army boots and we get a glimpse of the holy buck-naked baby Jesus.) We have handsome versions of The Gift of the Magi and some beautifully mature picture books telling the story of the famous World War I Christmas truce; and don’t forget great read-alouds like The Worst Christmas Pageant Ever and so many more. So call us if you need suggestions. We will do another special BookNotes highlighting non-seasonal children’s books in a day or so, so watch for that. We are glad that many people still enjoy giving quality children’s books as gifts this time of year. Even when many are cutting back and spending less on themselves – see the book and DVD The Advent Conspiracy for a great example of this faith-based movement to worship well and serve others, spending less on our own materialistic Xmas extravagance – there is something simple and right and good about sharing a book. Wrapped up easily, it’s almost a perfect gift. Kids may be confused at first, though, when they realize you don’t have to plug it in to recharge it! 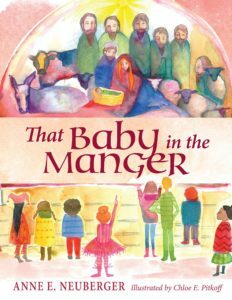 That Baby in a Manger Anne E. Neuberger, illustrated by Chloe E. Pitkoff (Paraclete Press) $15.99 I believe this is our favorite new Christmas book for children. It’s colorfully done in nice watercolors, soft and yet somehow rich, mostly conventional with a few touches of whimsy. There is a bit of a story here and it is so touching it will move you deeply by the surprising ending, I’m sure. Your children will, I hope, want to read it over and over. Here’s the basic story: It is a few days before Christmas and children from a school are visiting their Roman Catholic Church. They see that the baby Jesus figure is not yet placed in the crèche and wonder why he will look like. One girl tells the priest that she knows for sure what Jesus looks like and describes a white baby with blond curls (looking like herself and her favorite doll.) An older Latino gentleman is sitting the sanctuary and overhears and sets in motion a project to help the children realize that Jesus, actually, didn’t look like that. But then something else transpires and the way the nativity is told by way of this Catholic congregation’s Christmas Eve Mass and the role of their children (and their various, multi-ethnic dolls) is a sight to behold. A lovely, tender, faithful book that is fun and touching. The author and illustrator go to great effort to show the Messianic nature of Jesus’ birth, life, death and resurrection (which then circles back to the birth narrative) complete with artwork depicting classic white and pale blue prayer coverings on the Jewish men, almost magical straw that winds around, in one scene, to subtly create a Star of David. The inside flyleaf is an actual reproduction a manuscript of the scroll of Isaiah. It might strike some as an unfortunate re-make of the classic Christmas poem, complete with rhymes. Granted. Still, there is something compelling about the intensity of the story. As it unfolds it moves to the drama of St. John’s Revelation and the artists use Holy Spirited verve to illustrate the cosmic reign of Christ over all. There’s a hint of the multi-ethnic implications of the Kingdom and there’s a few remarkable images of the 21st century. 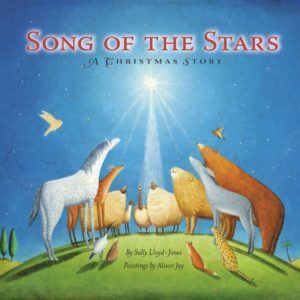 The Song of the Stars: A Christmas Story Sally Lloyd-Jones, paintings by Alison Jay (Zonderkidz) full children’s hardback – $16.99; board book – $7.99 We have promoted this gem as often as we can since it came out three years ago as we love it! What a great, perfectly realized book, combining fabulous art, creatively portrayed but with an antique edge, and a simple, poetic, text that faithfully reminds us that all of creation gets in on this redemptive moment. How refreshing to see whales and lions and angels! You know Sally Lloyd-Jones from her many, many children’s books, but mostly The Jesus Storybook Bible and Thoughts That Make Your Heart Sing both which we adore. But this simple telling of the Christmas story showing the glory of God, the goodness of creation, the grace of the gospel is wonderfully crafted, told with eagerness and wonder, all helping us appreciate anticipation. Highly recommended. 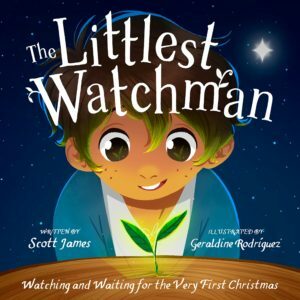 The Littlest Watchman Scott James, illustrated by Geraldine Rodriguez (The Good Book Company) $14.99 I am less fond of this kind of artwork that seems perhaps computer generated but I am told that kids today love this style – it is the sort one would see in the expertly done animation of the Disney films. It is bright and cartoony. But here is why I highly recommend this – it is a fable, to be sure, and teaches at least two essential Biblical truths. The story is about a boy who is given the task in his generation of being “The Watchman” who is called upon to watch for a green shoot to emerge from a dead tree stump. The boy’s father was a Watchman and has passed the calling on to his young son, enfolding him into the story, into the promises, into the responsibility. And herein lies a great truth: we can be people of hope, trusting the promises, hanging in there while we learn to wait in expectation. The boy in the story realizes how tempting it is to be distracted, to walk away from the task, to give up hope. It’s not a very exciting job, staring at a dead stump. But then something happens! Besides the good lesson of learning patience, learning to wait, learning to be faithful, is the second, bigger lesson: that God is faithful, that this odd little promise of a green growth coming from a dead log is a huge part of the background to properly understand Christmas. Advent is a good time to learn to wait, and it is a time to explore the Older Testament texts that promise the Coming. In many ways this book is itself hope-filled, and will – as David Platt says of it – “encourage your children and the child in you!” Here is a lovely and well-made video trailer promoting the book. It’s really nice and will explain what’s behind the book. Check it out and think of a child you could share this with! 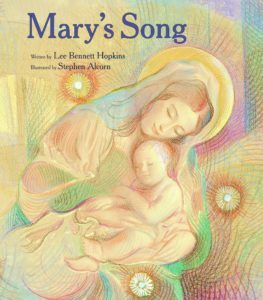 Mary’s Song L. Bennett Hopkins, illustrated by Stephen Alcorn (Eerdmans Books for Your Readers) $17.00 This is not, I should note, the Biblical song of Mary as recorded in Luke – we need a kids books doing that for sure – but it is one of the most lovely books you’ll find, a soft look, a gentle cadence, poetic and charming and good. I hope you know Lee Bennett Hopkins who is a very esteemed children’s author. The art is intricate and done, I presume, with pastels or colored pencils. Very nice. 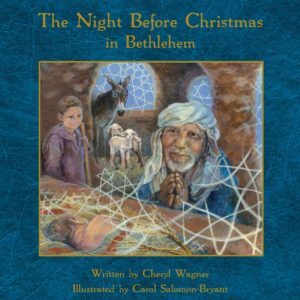 Goodnight, Manger Laura Sassi, illustrated by Jane Chapman (Zonderkidz) full sized children’s picture book – $16.99; padded board book – $8.99 There are a few reasons I love to show this one. First, it is just happy. There are some tellings of the nativity story that are too happy, zany, light-weight, which end up, in my view, being a glib distraction from the story. But, still, this is just pleasant and it’s fun. The folks look natural. There is a lot of orange, and it feels fun. But, it is helpful that the characters look Middle Eastern and multi-ethnic. Again, most of the silly, upbeat ones are pretty goofy, where he the pleasant art touches reveal some reality. There is one scene, though, where the joyous angels seem to look like dark-haired, olive-skinned men (playing instruments, including one with a small accordion – how ‘bout that?) Anyway, this cheery story has animals and shepherds and astronomers and all the rest, but it’s a cheery, colorful version for little kids. 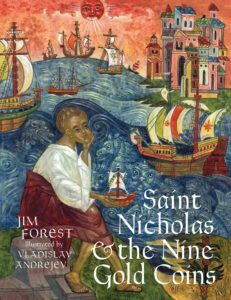 This colorful book, published by a Russian Orthodox publishing house, is written not only by an Orthodox convert (Jim Forest had known Merton and Dorothy Day, by the way, and has been a life-long peace activist) but is illustrated by a fine art illustrated raised and trained in St Petersburg. His own search for deeper meaning lead him to become an iconographer and these pictures for this story of the early life of Nicholas almost looks like icons. (Andrejey has teamed up with Forest previously for a great book, also on St Vlad’s, called Saint George and the Dragon.) This is classy, rich, lavish, even, and not at all silly. It is a book about virtue, about charity, a story of service and sacrifice, set in an ancient sea town, where Nicholas drew up and as mentored by his uncle. As Nicholas’s uncle taught him, there are many ways to be on an adventure, and following the gospel is one of the biggest adventures one can have. There are a nice few pages in the back that offer more details of what happened to this lad who grew up and became a bishop, known for his passion for Christ, for miracles and compassion and wise church leadership. For what it is worth, we have other books about the real man behind Santa Claus. 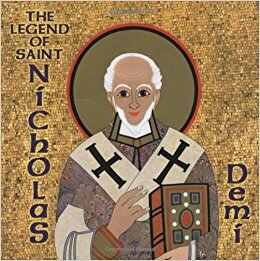 One that also beautifully captures the realities of the ancient church but also exclaims the legends from around the world is The Legend of Saint Nicholas by the award-winning illustrator and author, Demi (Margaret McElderry Books; $21.99) which is fantastic. 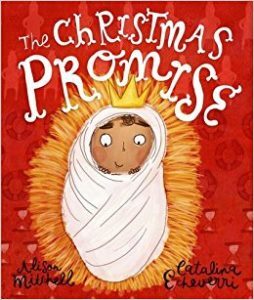 A Christmas Promise Alison Mitchell, illustrated by Catalina Echeverri (The Good Book Company) $14.99 I believe I might have said last year that this was our favorite Christmas kids book of 2016. It has a whimsy and playfulness to it that is hard to not like, but the flow of the Biblical story and Christ’s coming within that big redemptive narrative is similarly hard to miss. Too few books really show the big picture, and The Good Book Company’s handful of gospel-centered kids books do this very well. We love this great telling of the big story of the Baby King come to restore the planet. The pictures are wacky and surprising, with a eye-popping design (including the integration of some photos making it so interesting. Still, the content and message couldn’t be more solid. Highly recommended, along, then, with other great kids books from this evangelical publisher that gets it right. 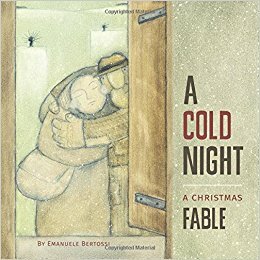 A Cold Night: A Christmas Fable Emanuele Bertossi (Spark House Family) $14.95 This is a fairly large-sized hardback with modern-esque illustration; I believe this book was first released in Italy. There is lots of sparse space in this text and the haunting illustrations are odd, evocative. The plot is simple – several animals notice how cold it is and observe a man and a woman looking for lodging. A star appears after their baby is born and, again, it is cold and quiet and peculiar. The strength of this unusually creative work is how empathy emerges, with so few words, and how much it leaves unsaid; it is sparse and cannot be accused of being preachy. Parents can discuss what else is happening in the story, which makes it very useful for conversations. 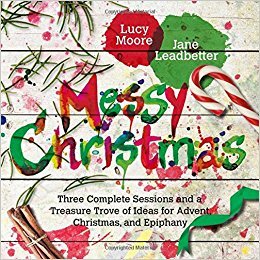 Messy Christmas Lucy Moore & Jane Leadbetter (IVP) $14.00 I hope you saw my longer description of this when we did a post about Advent devotionals a month or so ago. As I explained there, this is a new supplemental book that follows the new Americanized version of the popular Messy Church curriculum from the UK. Ideally, this is for congregations wanting to do an experimental worship programming, perhaps offering a fresh expression of a faith community, inviting non-church guests to a creative, inter-generational arts and crafts activity. People have found it really exciting to use and some smaller churches have used it as a VBS type thing on a weeknight, say. Of course, any family can adapt it to their own use, so why not give it a try with your extended clan? This offers three complete sessions and a treasure trove of ideas for Advent, Christmas, and Epiphany. We’ve got the new Messy Lent, now, too. 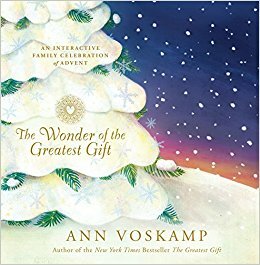 The Wonder of the Greatest Gift: An Interactive Family Celebration of Advent Ann Voskamp (Tyndale House Publishers) $34.99 This fabulously interesting interactive book is the third in a series, all which are stellar, wonderfully produced and substantive. First there was The Greatest Gift: Unwrapping the Full Love Story of Christmas ($19.99.) It is a lovely hardback offering ways to do the Jesse Tree tradition in your home, which is a great set of symbols tying Old Testament texts to Christ. We like the Jesse Tree a lot, and glad that Voskamp has been introducing it to so many. (Here is a precious, beautiful 4 minute video of Ann and her children doing it and you can see her remarkable paper-cut ornaments.) Well, after that fine book, there was the very nice, lavish, larger-sized hardback gifty edition called Unwrapping the Greatest Gift: A Family Celebration of Christmas ($24.99.) We are very fond of that and it is a great value for how substantial and artful it is. Based on her bestseller Unwrapping the Greatest Gift, Ann Voskamp expands her presentation of the timeless Advent tradition of the Jesse Tree with this beautiful keepsake that can be handed down and enjoyed for generations. Each December, families can celebrate the coming of Jesus by opening the book to see a 13-inch, three-dimensional Jesse Tree pop-up from the page. At its foot are 25 doors, one for each day of Advent, which hide meaningful, beautifully detailed ornaments, including the Christmas star, that are ready to be hung on the tree. Also inside is a simple devotional book with a reading for each ornament. 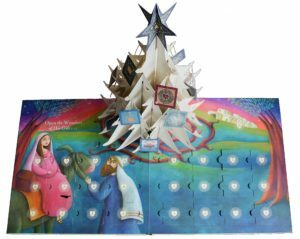 Create precious holiday memories with The Wonder of the Greatest Gift pop-up book and recapture the sacredness of the Advent season as you celebrate the epic pageantry of the coming of the Messiah. I really like how one of the editors at Tyndale explains it shows the various components and the complex pop-up art. Although we are obviously already well into the Advent days, most parents don’t mind playing some catch up, doing several of the brief activities on the same day. That’s fine. (Or get it on sale now and give it as a gift so a family you know can use it next year.) Enjoy this video little explanation, here.